What brand and whats the damage lke? Marpek wrote: What brand and whats the damage lke? Gonna order tua bao fm tao bao!!! So ive checked... they were replicas of tamiyas mfu including for their tanks! 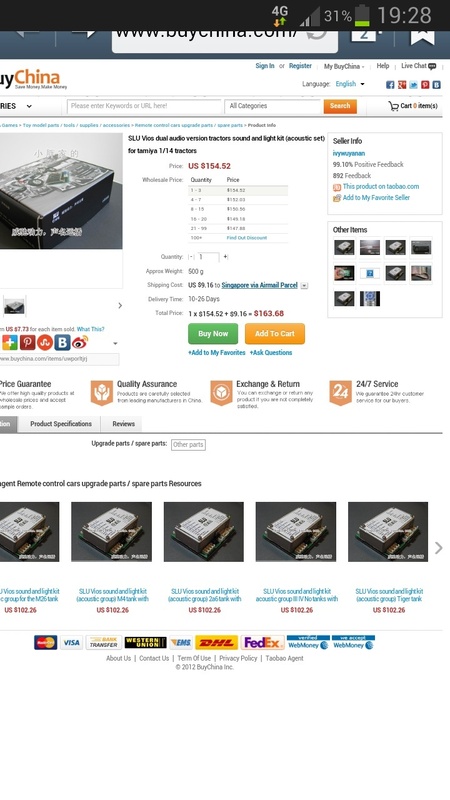 This seller ship only 9 plus to sin, but unsure includes speakers...etc. Hi guys,im new here...saw this ad regarding the sound module and its awesome....just wondering where can i buy this??? Nazzippo wrote: Hi guys,im new here...saw this ad regarding the sound module and its awesome....just wondering where can i buy this??? You can go take a look. Hi bro boolean,thanks for the reply,i dont really understand taobao shipment cause all is in different language...do u hv the link for it or someone who can help me order it? ?